I think Ribollita can be defined mostly by the core ingredients which always seem to be white cannelloni beans, kale, tomatoes and ‘stale’ bread. The rest of the ingredients are seasonable vegetables and that is why so many recipes are different. I believe that the first four I mentioned actually define this dish. Also, there is never any pasta added which might make it enter the realm of minestrone. One bunch of Kale washed and chopped. 1 bell pepper (any color) I chose yellow for contrast. (Afterwards it is important to keep a few cups of broth at your ready disposal to keep this just shy of a soup level) I used 3 more cups throughout the evening to keep it where I wanted. Wilt the kale into the soup/stew. 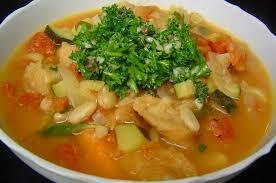 Serve soup/stew over toasted bread (or add crusty bread on top) and if you have fresh basil add that at the end.